I finished reading "Unbroken" a week or two ago but haven't had a chance to sit down and post a review on it. The book was FANTASTIC. At over 400 pages I was surprised at how fast I was able to finish it. I took the book with me during my short trip to Orlando back in mid May and must have told over 20 people how wonderful the book was. I was amazed at how vividly detailed the story was. At some points I thought that maybe it was TOO VIVID and found myself squirming a bit during the POW beatings. The author was SO descriptive that I found myself back in the 40's alongside Louie and his crew. "Universal is taking another crack at the story of Louis Zamperini, the Word War II-era story of a hard-luck kid-turned-Olympic hero-turned-Japanese POW. 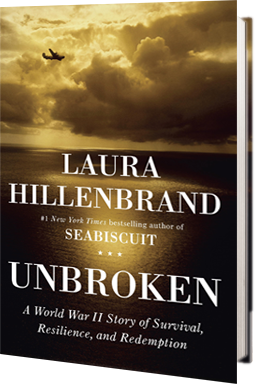 The studio has picked up the rights to Laura Hillenbrand’s best-selling novel, Unbroken: A World War II Story of Survival, Resilience and Redemption. Francis Lawrence, who just tackled period with the upcoming Water for Elephants, is in talks to direct the adaptation. Matthew Baer and Erwin Stoff will produce. Filmmaker (and Zamperini's son-in-law) Mick Garris is exec producer." I'm halfway through my book reading resolution ... 3 out of 6.